When it comes to creating a business on the internet you have a few different options. You can become an online marketer that focuses on affiliate marketing and continually creates new ad campaigns, always trying to make a profit, then moving on to the next great offer… or you can focus your efforts on building a long term money generating web site. Sure, the concept of a long term money generating website sounds great, but it definitely doesn’t come easy, especially if you don’t know where to start. No matter if you are a trained marketing veteran, or just a newbie who is looking to start making money online, buying established websites can be an excellent way to break into the world of online marketing. Best of all, the cost of entry can be very low or high depending on your initial investment money and the type of web site you would like to purchase. Through sites like Flippa.com you can bid on web sites and search the marketplace to see the thousands of listings of available websites for sale. I highly recommend that you take some time to look through their web site and see what types of web sites people are selling, how they are making money with their sites and the multiples of earnings they are actually selling their web sites for. Now that you have the resource of Flippa.com to perform the necessary research before buying a web site, here are an additional three quick tips to think about before making your first web site purchase. Depending on your knowledge of business and the internet, this point can heavily swing all over the place. One of the major misconceptions that people have about the internet, is that everything is so simple and easy. Just because you don’t need to pay for rent and have a full staff, you can still invest a lot of money in a project, then end up going broke. If you already know how to sell specific products and services, or already have web sites or blogs in a niche market, it’s best to stay within this same area and continue to grow and expand at what you know. I’ve personally bought some web sites that looked liked they would be fun to run, but in the end they were just a distraction and ended up wasting more time and money than actually doing any good. Don’t make this same mistake. As great as a resource Flippa is, there will always be people out there to get you and looking to make a quick buck. I’ve personally done over six figures in web site buys and sales through Flippa and this type of rating and history goes a long way. It’s much easier on the mind to buy from users with a good long term history of sales, then it is to buy from someone that only has $50 in sales history. While this might not always be the case, it’s very important to always contact the sellers of a web site directly, ask as many questions as possible and always try to verify all traffic and revenue stats. Lastly, the way you buy and sell web sites on the internet is just as important as how you make any big purchase in the real world. Flippa has a lot of options, but you should focus only on making payments through Paypal and Escrow. I would recommend using Paypal for any sales in the $1-$2000 range, then anything above $2k I would recommend escrow. Both of these payment services offer protection, but for very high end sales, Escrow is the way to go. There are some fees associated with Escrow, but the seller of the site will usually cover these costs if the site ends up selling for a decent amount. As mentioned, whether you are just starting out, looking to make a side business or looking to expand your businesses online, buying and selling web sites is always a great place to get started, even if you are just looking for an amazing resource to learn how people are making money with their sites. For more information and tips on how to buy and sell web sites effectively through the use of Flippa, you can check out my book called “Flip this Web Site“, which has helped thousands of internet users buy and sell their first web site. Guest Post By: Zac Johnson is a online marketer with 15 years of experience and also a blogger at BloggingTips.com and my Affiliate Marketing blog, as well as the founder of PPC.org. Wow, how interesting – I had no idea you could auction off a website or buy on through an auction. Jeremy, have you ever bought an established site? I’ve done over six figures in buying and selling on Flippa, so I can vouch for the quality and safety. You just always need to perform the necessary research when buying. No I’ve never bought an established website myself, although it is something that I would love to get into someday. I really like the early stages of building a website into something. So I always just start from scratch. It would be much more productive to start with an established base though. I would rather start from scratch. The idea of building something is much more exciting that having to transition something that you paid a lot for. I’ve always been in that mindset too, but I could see a lot of advantages to buying an established website instead. Perhaps they’ve built up a lot but just didn’t properly optimize it. With a minimal amount of work, you could turn it into a much bigger money maker. I love Flippa.com and seeing what people have to offer! It’s AMAZING the price that some of the websites sell for. I never thought about checking out the sites and determine how they’re making money though…that’s a pretty good idea! Thanks for the tip Zac! Sometimes you will come across some real winners that provide a lot of information on how they are making money. It’s an amazing learning tool. I’m in the same boat. I’ve sold more than one website, but it’s usually fairly expensive to buy someone else’s site. If I had more money to spend I might get into it more. Very interesting! I need to check out Flippa. It’s definitely the best site for buying or selling a website. Just do proper research before committing to anything on there. Great post!! I haven’t heard of this site before, so it’s nice to check it out. Once you buy a website, I assume you have to continue the maintenance and posting right? Or can you hire the original writer? Interesting what goes on with websites these days. What websites have you purchased? I’d like to know more about your experiences! Depending on what the previous owners plans on doing, you can usually hire them or the team that is writing for the site. This is what I did when I purchased bloggingtips.com. I kept for the full writing team and added a few more on. I’ve done this several times and am currently stuck with sites I have no interest in having 🙁 Sometimes it’s a curse! Thanks for the really nice overview Zach. I have been doing some searches on Flippa and haven’t seen anything that has peaked my interest yet. I was just curious as to the general breakdown between the source of where you are finding your websites to purchase. Are most of them coming from sites such as Flippa or are you having any luck contacting sites directly? It’s pretty much a matter of checking Flippa often and seeing if there is anything you like. If you don’t check it often you can miss out on some sites that might be of interest. Sort by “Most Active” to see what everyone is bidding on, or “Ending Soon” to see what will sell in the next few hours. This is great information! 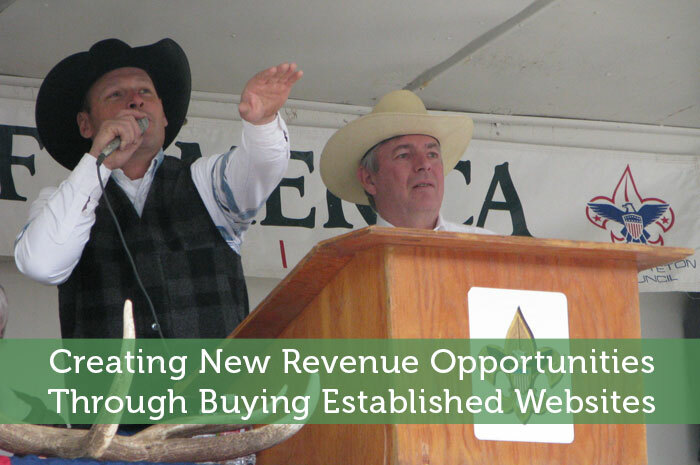 Over the years, I’ve heard Internet marketers talk a great deal about buying established websites, but I had no idea how it was done. You post explained it beautifully. thank you for sharing, and I’ll definitely be paying Flippa.com a visit. Thanks, glad you liked how I laid it out. I used flippa a lot for just reading and research. You make a very good point on using it to see how others are doing and what you can possibly incorporate. I hadn’t thought of just using it for research. It does open up your eyes to how much money can be made in different niches with different approaches. Thanks for the tips Zac. If anyone ever becomes interested in MyMoneyDesign.com, I’ll have to remember the part about Escrow and Paypal. Well I hope you don’t sell anytime soon. Usually with a blog you’re bound to make much more money in the long run if you just stick with it. Great tips! I never knew about Flippa.com and now I can’t stop looking at it. Seems like a great place to learn a lot. Ha nice, it’s a real time sucker! I’ve flipped domain names before, but never a website. My plate is definitely too full at this time for another site, but I often run across defunct sites that I want to buy, just too afraid to pull the trigger. Flippa is good for domains names, but mainly web sites. I’ve grabbed a few nice domains through Flippa in the past. Really interesting stuff. I’ve wondered about this market for a while – definitely don’t know enough (yet?) to do it myself though. Perhaps you just need a good partner who can handle a lot of the technical stuff. Maybe someone who has a lot of experience with website marketing and affiliate promotion. Maybe someone who currently runs a personal finance blog. Maybe someone named Jeremy lol. Wow very interesting… buying an established website makes sense to me. When you think how much advertising income etc. a good website can make, it’s a great passive income if you can hire the right writers. For sure. I see some bloggers taking this approach and buying lots of blogs to add to their blogging empire. For the right kind of website, you might not even have to spend much each month to maintain it. It’s a lot quicker than trying to build up those websites from scratch. I do think that it’s an interesting idea. I agree with Bridget, you would have to have a lot of courage to buy someone else’s website, unless it was at a low cost. I think it would be something I would have to research for awhile. It takes some courage, but usually the price is based directly off of how much money the site has made in the last 12-18 months. So provided that income hasn’t recently dropped, it’s probably not too risky. You do have to wonder why they are selling. Sometimes they realize that the income may soon dry up. haha I know the feeling. Just one website can be a lot to manage. Eventually though you may find ways to streamline your work and figure out how to take advantage of outsourcing. I don’t think it’s feasible to properly manage too many websites all on your own. I have thought about buying other sites it the past but I have found that I get much better value putting my effort into my own site. It is really hard to pick up on someone else’s site unless you think along the same wavelength. That may be the case with certain types of websites. With a blog, it is a bit tough to suddenly switch writers and maintain the same approach. There are some types of websites that can be adapted to your style more easily though. It may not be exactly how you would set it up yourself, but it could still become quite profitable. Wow, what a cool tool. I agree, even just using this for research could provide valuable for someone getting into niche sites. I think I’ll poke around a bit and see what I can find…Thanks for the post! I actually haven’t checked out flippa in a while. I should poke around a bit too. I’m not looking to start a new website or buy any websites, but it’s interesting to see what else other people are up to online. I have contemplated buying other blogs but revenue is not always consistent and their does not seem to be a formula to a blog purchase (not really established like most businesses). I’m sure the inconsistent income is why I a lot of blogs are sold. So to make it worthwhile you’d really have to know how to take them to the next level and milk more money from them. I have bought a couple of site on Flippa and if you do your research you can snap up a real bargain. I tend to look for sites that haven’t reached their full potential, check its background and see if the webmaster is doing something stupid that could be easily corrected or improved upon. I managed to treble the traffic of one website in 2 weeks just by fixing a few onsite problems. I really should get into that kind of business since I actually enjoy fixing up websites like that. The only thing really holding me back is how I am banned from adsense. That really limits revenue potential for a lot of the sites on flippa.